Here is an 11x14 seascape oil painting of Perkins Cove in Ogunquit Maine. If you've ever been to Perkins Cove, you know the power of the surf that can swell and crash onto the rocks there. It is magnificent! 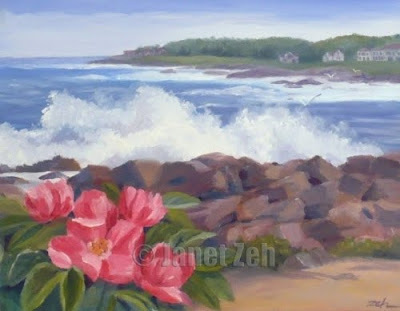 In this painting, I've added the rugosa roses that bloom along the shore. This painting was done using a double primary palette - meaning one using a cool and a warm of each of the three primary colors. This makes a painting with stunningly fresh and beautiful colors. If you'd like to see more of my work, visit zehoriginalart.com. Thanks for stopping by to see beautiful Perkins Cove. This painting is amazing! Color combination and contrast makes it more pretty.